Originally known as Ci Yin An 慈荫庵 (Nunnery of Sheltered Mercy), this breath taking multi-level temple complex is known as the Shaxi Pear Orchard Temple. Commanding spectacular views across the valley from its vantage point at the head of Diantou Village, was actually a functioning nunnery for much of its 500-year history. 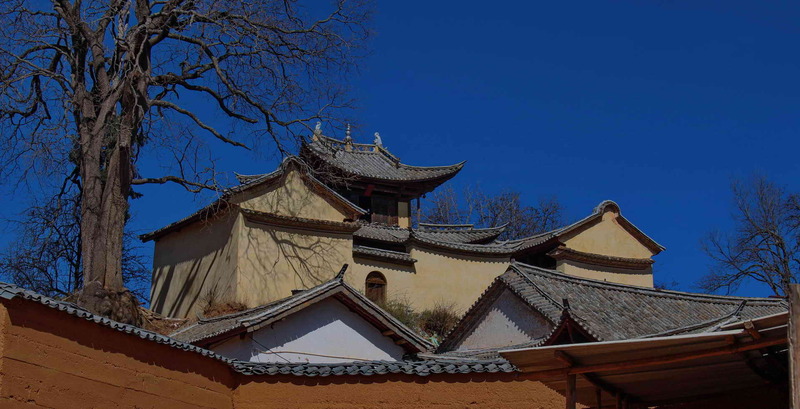 Shaxi Pear Orchard Temple was maintained by the Elders of Diantou Village, who collect funds for repairs and temple festivals. But by the mid-2000's, the temple was crumbling and had become too expensive for the village to repair and so began its decline. In 2011, Chris and Nam Barclay, a Thai-American couple visited the temple to pray for a child at the Guan Yin shrine and soon after their “miracle baby” Hannah was born. In gratitude, the Barclays committed to fund the restoration of the temple to its original condition. You can see more about their moving true story here. The temple complex houses four unique shrines on four levels, together representing a mix of Buddhist, Daoist and folk religious traditions. Above the main courtyard is the Hall of the Goddess of Mercy or Goddess of Compassion (Guan Yin 观音). In this shrine, the Mother Goddess is depicted with a baby as Songzi Guanyin (The Guan Yin Who Brings Children 送子观音). The name Guanyin is short for Guanshiyin, which means "Perceiving the Sounds (or lamentations) of the World". It is the Chinese translation of the Sanskrit name Avalokitesvara, the Indian bodhisattva of wisdom and compassion, the unfailing savior of all beings. Guanyin is revered in the general Chinese population due to her unconditional love, compassion and mercy. In Chinese Buddhism, she is the Mother Goddess, the great protector and benefactor of the weak, the ill and especially children and the babies. By this association she is also seen as a fertility goddess capable of granting children. In Daoism she is revered as Songzi Niang Niang, the Maiden Who Brings Children. An old Chinese belief involves a woman wishing to have a child offering a shoe at a Guanyin Temple. Sometimes a borrowed shoe is used then when the expected child is born the shoe is returned to its owner along with a new pair as a "thank you" gift. The Barclays, an American family who recently restored the temple, prayed to Guan Yin and after years of not being able to conceive, were blessed with a helathy baby girl, Hannah. You can see their touching video here. Hidden away on the second level of the temple is a quiet hall which overlooks the courtyar. This is the Pear Blossom Teahouse. Designed by project owner Chris Barclay, the teahouse serves lunch and dinner from a seaonal vegetarian menu. The Teahouse is not easy to find and most know of it through word-of-mouth. There are no signs in the temple pointing guests inside and so most tourists don't know about it. Our chef, Madam Yang is a resident of the temple's Diantou Village and is a master of local vegetarian cooking. She doesn't speak very much English but she has young assistants who help with foreign guests. There is a broad imported wine selection as well as local beers and of course diverse teas from around Yunnan. Throughout the year, the people of Diantou Village will gather at the Pear Orchard Temple to celebrate religious days. There is a large kitchen reserved for ceremonial and festival cooking, separate from the Pear Blossom. Early in the morning, the village women elders (Lao Mama Hui) will arrive to prepare the kitchen and shrines while the men prepare the many tables and benches required for the large meal to follow. Alms are collected for each occasion to help pay for the cost of food and cermonial items. Those lucky enough to arrive during the time of the month when rituals are performed are welcome to join in and have a meal. A small donation to the temple is recommended. Chef Yang is also an accomplished traditional dancer and leads Diantou Village's women's dance troupe. Groups can request in advance a demonstration of Bai ceremonial dance and particpate in learning with the troupe. Blessing ceremonies may also be arranged through Madam Yang, who can ask the village priest and women elders to perform a special blessing ceremony for children or those dealing with poor health. At least one day's notice is required to gather the local people who typically have farming and household work to tend to each day.